Enriched with Avocado Oil, Sunflower Oil, Shea Butter, Aloe Extract, natural vegetable Glycerin, & natural Vitamin E to soothe & heal hardworking hands. 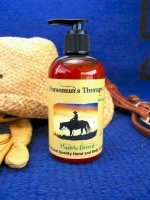 Fix those cracked fingers & heels without that greasy feeling...no oily, greasy hand marks on your tack, either. Very gently fragranced with botanical Essential Oils. You take good care of your horse, dog, tack, & equipment...take good care of the hands that take care. Vegan formula, NEVER tested on animals. 8oz. Ingredients: Distilled water, avocado oil, sunflower oil, soja glycene, shea butter, aloe extract, vegetable glycerine, plant-based emulsifying wax, palm stearic acid, xanthan gum, rosemary extract, willowbark extract, grapefruit seed extract, ascorbic acid (vitamin C), tocopherol (vitamin E), phenoxyethanol, botanical essential oils.